Neuenfels’s imaginatively uses members of the chorus as black and white rats. In their second year, they seemed to be getting the upper hand - perhaps it is Rise of the Planet of the Rats? It is the black male rats - often with glowing red eyes, long fingers and toes - that greet King Henry at the start of the opera. They shed their outer-rat persona when Lohengrin is first sighted and are now dressed in canary yellow. Their female counterparts are in wedding dresses of a variety of pastel shades and lavish hats. The rats remove their outer ‘skin’, they are collected and put on hooks to rise high above the stage. We now see this from a camera high up above the Festspielhaus stage. Much the same happens to the caged male rats in Act II before the wedding preparations. They return later with a bald pate and appearance made famous by a British music hall star of yesteryear called Max Wall. As it all unfolded before me a second time last summer, the appearances of a cute gaggle of small pink rats in Acts II and III generated ‘Oohs and Aahs’ of appreciation from the theatre audience. It seemed to be making this Bayreuth’s answer to a popular Disney musical. The great British stage director, Richard Jones, once replied when asked to explain what an opera production of his meant, ‘Well, what does it mean to you?’. I am not sure what Neuenfels wants me to think and it increasingly matters less and less to me. I have still not entirely worked out the significance of the three ‘Wahrheit’ (Truth) animations that are seen from time to time but even these were not the distraction they seemed before. Here on the DVD they are shown over the Preludes and are available separately in the ‘Extra Features’ that also includes a few short interviews with Katharina Wagner, Hans Neuenfels, Klaus Florian Vogt and Annette Dasch. In Act III the rats’ heads are merely helmets and the men and women are in uniforms with ‘L’ on the front and a swan silhouette on the back - all now have bald heads. Another question is how do they know his name is Lohengrin as he has not told anyone yet? At the end of the Act I high above the stage a plucked swan was seen and I wondered why? The answer to what became of its feathers comes when a black boat/half-an-egg rises full of feathers out of the bridal bed as Elsa imagines its return at ‘Doch, dort - der Schwan - der Schwan!’ Elsa later appears as if in mourning and totally distraught though she soon strips and gets to grips with Lohengrin but it is all too late for them both. The egg returns and is ‘cradling’ her lost brother, Gottfried, who will become the new ruler of Brabant. In this case he is like the result of some gruesome genetic experiment gone wrong as he tears apart his umbilical cord and frees himself. Lohengrin wanders to the front of the stage and continues even after the music stops and the curtains close. The flexible camerawork focuses on all these pivotal moments of Neuenfels’s Konzept … and much more. Samuel Youn is an imposing Herald and though eschewing all sense of majesty in a portrayal of King Henry as fitful and neurotic, Georg Zeppenfeld is equally excellent. Jukka Rasilainen impresses as the weak-willed Telramund, who has no hope of being good enough to bring Ortrud the power she craves. Petra Lang is surely the best of the all the current Ortruds. It is wonderful to have her assumption on DVD for the first time here. Melodramatic possibly, cajoling, manipulative and Machiavellian certainly, her incredible vocal range is never heard to more thrilling effect than in her demands for revenge in Act II - ‘Entweihte Götter! Helft jetzt meiner Rache!’ This is clear evidence - if any is necessary - that her forthcoming role debuts as Brünnhilde should not be missed. Annette Dasch was very good as the troubled and ‘wounded’ Elsa with her pliant soprano voice only occasionally sounding possibly a little too small for Wagner. Klaus Florian Vogt is a wonderfully laidback Lohengrin. Mostly he sings with his typical incredible ease, impeccable phrasing, eloquence, delicate pianissimos, and flute-like tones. However the camera does not lie and it reveals that even he finds his Act III ‘Grail Narration’ rather more challenging than it appears from the back of the stalls. Andris Nelsons got the measure ofLohengrin in the second year and here is evidence of a supple performance, rich in detail, and with each act’s long dramatic span being impeccably sustained, allowing for climaxes as thrilling as could be hoped for. 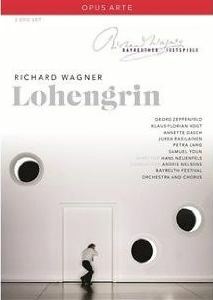 Post-Wolfgang Wagner Bayreuth has its critics but this Lohengrin - and the Stefan Herheim 2008 Parsifal that will be broadcast and recorded this summer - shows it at its very best. I strongly commend this DVD to those who want to know what is current at Bayreuth … or to those who have seen it in the Festspielhaus or on TV and want to relive it.